Buried underground in much of Alaska is a layer of soil that stays frozen all the time. 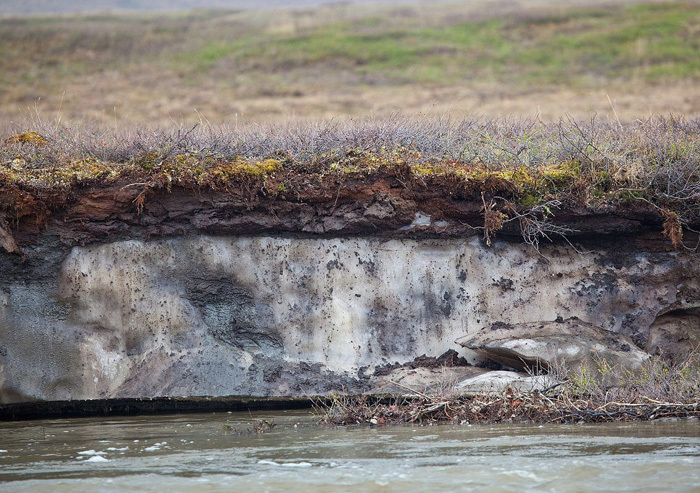 This layer, because it is permanently frozen, is called permafrost. Much like glaciers, permafrost is made up of soil, rocks, and frozen water. During the winter in most other places, the ground can freeze up to 12 inches deep. It then thaws quickly when the air above warms. Near the Arctic Circle, over many, many cold winters, the ground is frozen sometimes as deep as 2,000 feet. The short summer sun just can't warm the earth deep enough to reach that frozen ground. 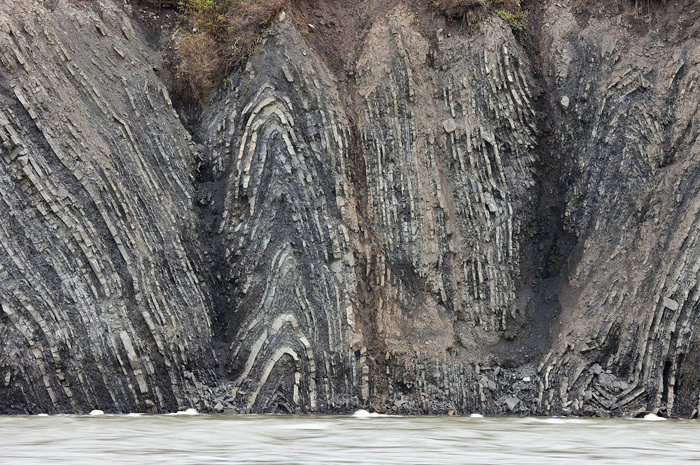 The thickest permafrost is found north of the Brooks Range in Alaska's arctic region. This is where you'll find it as thick as 2,000 feet, or about a half mile deep. As you travel south, the permafrost gets thinner. Sometimes there isn't any at all. By the time you get to Anchorage, you will find only a few frozen spots. In Southeast Alaska, permafrost is only found in the mountains. Scientists at the University of Alaska Fairbanks Geophysical Institute started tracking the temperatures and depth of permafrost in 1976. That was the year before the Alaska Pipeline was finished. They are finding that the farther north you go, the faster the warming. Permafrost along the Arctic coast is now 2.5 degrees warmer than it was in 1976. Farther south, it is a little less than 2 degrees warmer. The arctic is a relatively dry place with little rain or snow. The layer of frozen ground keeps what little moisture that falls close to the surface of the ground where plants need it to grow. In some areas, the water forms small ponds and lakes where animals can get a drink. The plants that do grow above the permafrost form a layer that protects the frozen ground from the almost constant sunshine of the arctic summer. This helps keep the ground frozen. The frozen ground is stable. When it melts, the ground above can sink. This causes roads that were flat and smooth to become full of humps or frost heaves. If buildings are built on this frozen ground, the melting can make them shift and even fall down. 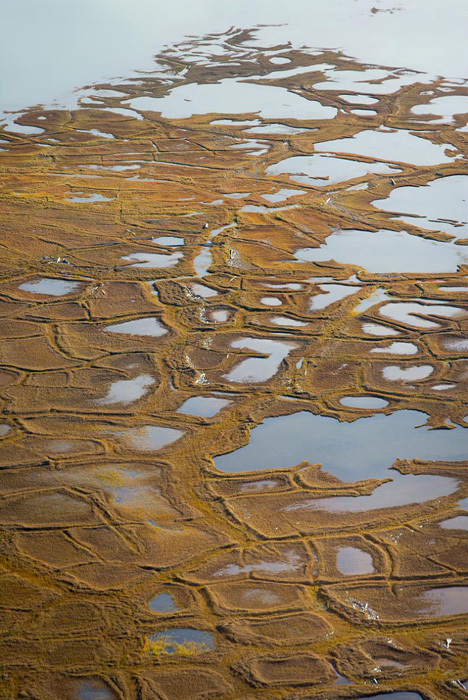 When the permafrost melts, it can release methane and carbon dioxide gases that were trapped beneath it. These are two gases that have contributed to the greenhouse effect and global warming. So the melting permafrost may be adding to the problem. http://arctic.fws.gov/permpics.htm - The Arctic National Wildlife Refuge website offers a section on permafrost with diagrams and photos illustrating features of permafrost.